I did a double take while watching this. 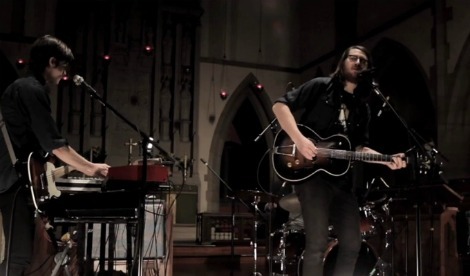 Here’s the video of The Wooden Sky performing their song “Dancing At My Window” as part three of a five-part series of live performance videos shot in at the Grace On The Hill church in Toronto, directed by Scott Cudmore. The video continues the story from Pt. 1 and Pt. 2, with the band locked in the church due a storm that seems to be happening simultaneously in France. I heard the thunder in my headphones and I totally thought it came from outside my window. Of course, there’s really no sign of rain today, just back to cold from the nice weather we had last week. The Wooden Sky recently released their latest record, Every Child a Daughter, Every Moon a Sun, out now on Black Box Recordings. You can stream the record in its entirety at Exclaim. The Wooden Sky – Grace On A Hill Pt 3 – Dancing At My Window from Black Box Vimeo on Vimeo.